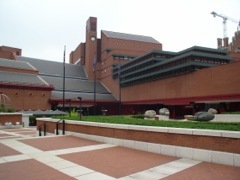 I Finally Made it to the British Library and then Back to the Museum. Sat with my drafting class, some of them were going to Brighton for the day. The other half was telling them they were nuts, that it would be too cold and windy. I'll have to find out how it went for the travelers on Monday. I also saw Naomi, she just graduated with her Bachelor's in "Peace." A very politically conscious degree program offered at a university in England. She's shepherding a group of Students from Michigan State around for the next couple of months. Sounds like a good gig. The weather is really cool. I'm actually wondering if I'm going to have to buy a sweater. I took my time this morning, looked at St. Pancras church on the way, which has a row of women who are columns that look just like some ancient Greek statues on display at the British Museum. Kind of wild that the British Museum has had its Greek and Roman displays for long enough, that builders in London have incorporated ancient design elements into the buildings of the last two hundred years. I also saw first editions of Shakespeare, scribbled notes of song lyrics by John Lennon, the Lindisfarne Gospels, etc. etc. But the thing I was most intrigued by was the Gospel of St. Cuthbert. It was bound in the 7th century and is still in its original binding. When Cuthbert was dug up to be put in a new spot, they found the little gospel book on top of the casket. It's a beautifully tooled book, and is roughly the same binding style as the one I already know how to do. It's in Uncial Miniscule (check out the pretty scripts from the Anglo Saxon day of classes) and is of the Book of John. An arts and science project waiting to happen. The Library building itself is brand new really. The books used to be inside the British Museum, but they split it up and built a brand new state-of-the-art facility for the Library. It only opened in 1998, so the new hasn't worn off yet. Dum de dee dum da da dum! The big event, half the reason I'm here... the manuscript room. Yesterday I received a disturbing email that said they had given my main manuscript to someone else. The email said that they run a manual system so it didn't really matter that I had emailed and reserved it. (Well and they included an apology.) Anyway, I went in ready to do battle. But it was all very easy to clear up. Very cool to get to put into practice what I've been learning all week. Both of the manuscripts I looked at today were kind of low quality productions. They have a bit of color, but the vellums appear to have been the waste sheets along the sides of the animal. One of them has little perforations on every other page, all along the edge. That's where the hide was stitched to the stretching frame while it was being processed. Normally those wouldn't be left on a book, but on this one, the binder had to leave them because there's not enough to trim. Another oddity is that there are occasional holes in the vellum where the person scraping it must have accidentally poked a whole. They are original to the manuscript because the scribe has carefully written around them. Jim Gregory (from Kalamazoo Michigan) was in the classes I went to last week. He's working on The Book of Margery Kemp, and is actually getting to work from it in the Manuscripts room. We met up this afternoon and did the British Museum together. We could both agree on what we wanted to see--Sutton Hoo & Rosetta Stone. The norse burial stuff is very cool. I took pics of the lyre from Sutton Hoo and the lyre fittings that survived from the Taplow digs. Was also cool to see the purse of coins, each minted in a different Merovingian mint on the continent. The three mints that he didn't have a coin from had blanks instead. It was almost like looking at someone's stamp collection, except that this Norse King's collection was made out of gold. So much to look at that it boggles the mind. Just look at the pretty pictures. So Jim's been eating at a place called "The Rocket." It has a special deal, 2 meals for 5.50 pounds. (About $11). That's darn cheap for London, so I've eaten my first meal in a restaurant. And really, I couldn't have done better at the Indian grocery. Amusingly, we still ordered Chicken Masala. So I haven't broken my Indian for dinner tradition. The dorm thing. Jim is paying 6 pounds more a night, but doesn't have internet hookups, or laundry facilities. And the dorm is just very secure. (I have to use a swipe card to get in, then my room is locked, and my window faces an enclosed garden.) His room is a little smaller than mine, but a bit nicer. He has an electric kettle in his room as well. (So I guess it's not just a dorm thing.) But he has to pay to use the internet. However, they do provide teabags for him. He let me swipe some so that I could eat in my room tomorrow so we can get an early start.